Yicheng Luo - Rock you like a hurricane! Yicheng Luo has been in the yo-yo game for a long time and we are really excited to see him creating a new line of yo-yos for the modern yo-yo player! With the success of the L5 he immediately went to work on something completely different, but equally as impressive! The Hurricane! This is the new and improved version of the first production yo-yo that Yicheng Luo ever created! The original Hurricane was a revolutionary yo-yo for it's time but due to production issues it ended up being a very limited release that didn't truly get the credit it deserved. Yicheng Luo wanted to recreate his original design and give it some modern styling to keep up with today's competition level designs, and he did an amazing job! The New Hurricane is a full sized organic yo-yo with a pleasantly unexpected play style. Machined from 7075 Aluminum has a great weight distribution and feel. It plays really fast, super maneuverable, and with the rim heavy weight distribution it is surprisingly stable and long spinning. The organic shape give it a super comfortable feel in the hand and the combination of classic and modern design gives this yo-yo a really unique feel on the string. Fitted with a genuine Dif-e-yo Konkave bearing and some beautiful engravings, the Hurricane is an excellent choice for collector or competitor! 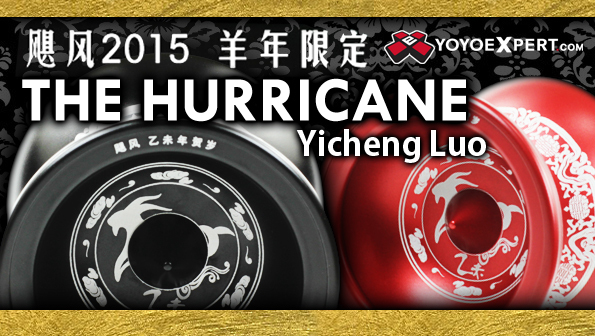 Hurricane Retro are special edition for this year celebrating Chinese New Year and this current "Year of the Sheep". The sheep and other logos on the engraving mean good wishes.